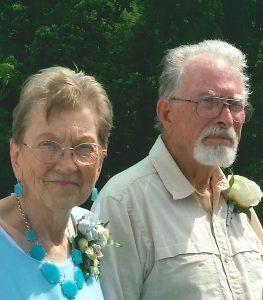 Age 84, of Lansing, Michigan, beloved wife, mother, grandmother went home to be with the Lord, Wednesday, April 3, 2019. She was born February 17, 1935, in Albion, Michigan, to the late Alton and Mabel (Grundeman) Cartwright. Virginia worked at Dean Transportation for over 20 years as both a bus driver and attendant, she took a great deal of pride working with special-needs children. She was a devoted member of Trinity Evangelical Lutheran Church. In her spare time she was an avid traveler, taking many trips all around the world, including riverboat cruises. She also had a love for music. She was a huge sports fanatic especially the MSU Spartans, and the Detroit Tigers, finding a great deal of joy watching the Tigers beat the Yankees. Surviving are her husband of 62-plus years, Raymond Mizga; children: Alton (Deb) Mizga, Julie Mizga-Karr, Becky (Brian) Kindel, John (Peg) Mizga, and Jim (Tonya) Mizga; grandchildren: Victor Karr, Audrey Karr, and Cecelia Mizga; and one great-grandchild on the way. She is also survived by a sister-in-law, Lisa Cartwright, a niece, Sara Cartwright, as well as a large extended family. She was preceded in death by her stepfather, Harold Bedarstadt, and a brother, Donald Cartwright. There will be a funeral service held 11:00 a.m. Monday, April 8, 2019, at Trinity Evangelical Lutheran Church, 501 W. Saginaw St., Lansing, MI. Visitation will be 2:00-5:00 p.m. Sunday at the Estes-Leadley Greater Lansing Chapel, also one hour prior to the service at the church. In lieu of flowers memorial donations may be made to Sparrow Hospice Services or House of Promise. My memory’s of your kind warm open heart will always be with me, the Lords speed during your journey through the Golden Gates. Rest Ma Mizga, give hugs to my beautiful cari when ya see her. Till we meet again. I am so very thankful to have been able to call you my Grandmother; you always treated me as one of your own. I will forever cherish the memories I had with you and will miss the sound of your laughter. You will always be in my heart. Ginny and Ray introduced my parents to each other. I am privileged to say I do not remember a time when you were not part of our lives. My Mom and Ginny started school together as children and had a life long friendship. Ginny and Ray were a rock for my Mom when she lost my Dad and during her many illnesses before we lost her a year ago this month. Ginny gave the gift of love, a positive attitude, smiles, hugs and encouragement to everyone she knew. I feel so lucky to have had her in my life for so many years. Ginny, say hello to Mom and Dad for me, we miss you all! Gods speed on the Angels wings! Virginia you were a second mother to me and I always appreciated that you were so kind to me. And you fed me quite often as well 🙂 I will always remember you with love and fondness, your laugh and the twinkle in your eyes. You always encouraged all of us boys to do the right thing and stay out of trouble (what can I say, you tried 🙂 I sure will miss you and look forward to seeing you on the other side some day. Virginia I always remember your beautiful smile when I saw you at church. You were one of my Mom’s best friends so I felt you were looking out for me when my mother died in 2012. You were always so kind and a good listener. We often talked about our lives and MSU sports. When MSU played Duke in the Final 8 I was thinking about you and I kept saying, “Let’s win this game for Virginia”. Every week as we left church you would say, “See you next week”. Now I feel you are saying, “See you in Heaven”. I love and miss you but I have faith that I will see you again. Virginia you were a grounding source of light, love, hope, and friendship to the both of us. Our lives will be forever better for knowing you and experiencing your strength in Christ. we take comfort in knowing we will be together again. So very sorry to hear about Virginia’s passing. Know that the love she showed you will sustain you now.